Corot's career only began in 1822 when his parents finally agreed to let him become a painter, rather than a cloth dealer like his father. The young man immediately began to make up for lost time through work and travel. Corot was an inveterate traveller. He began by painting the surroundings of Paris and Normandy from life between 1822 and 1825. He then went to Italy for three years, spending time in Rome, Naples and Venice. He followed this with the rest of France, and other countries such as Switzerland, Holland and England. As a child, Corot had been at a boarding school in Rouen from 1807 to 1811; he returned to Normandy in his first years as a student, then again in 1829 and 1833 when he painted the picture here. The Quay at Rouen is a composition reminiscent of the great Dutch seascape painters. 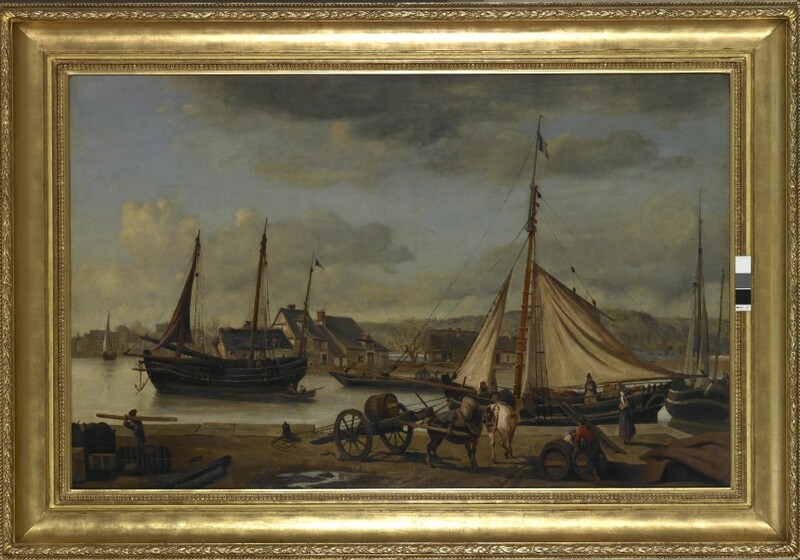 The Rouen painting, as the artist said himself, was a work where ‘if Ruysdael and Van de Velde wanted to help, I would gladly accept.’ It is true that the painter seeks to render the effects of light and substance on the river and to dwell on details very much in the Dutch manner. Corot's listing of the various elements in the composition may seem of secondary importance. We know that he made many sketches of the port of Rouen, with its people, boats and quays. All in all, here we have a rare example of a study, a kind of pastiche, a work ‘after the manner of’, dating from the very end of the period when Corot painted landscapes from life between 1822 and 1833.